Warehouse Management allows you to keep an audited record of inventory movements related to both receipts (Purchase Orders) and deliveries (Invoices). To utilize this feature you must first check the “Enable Warehouse Management" box in the Bindo iPad app under Bindo Settings > Add-ons. Track fulfillment of submitted Purchase Orders by generating a "Good Received Note". Note that an order must be marked Submitted before you can fulfill it. 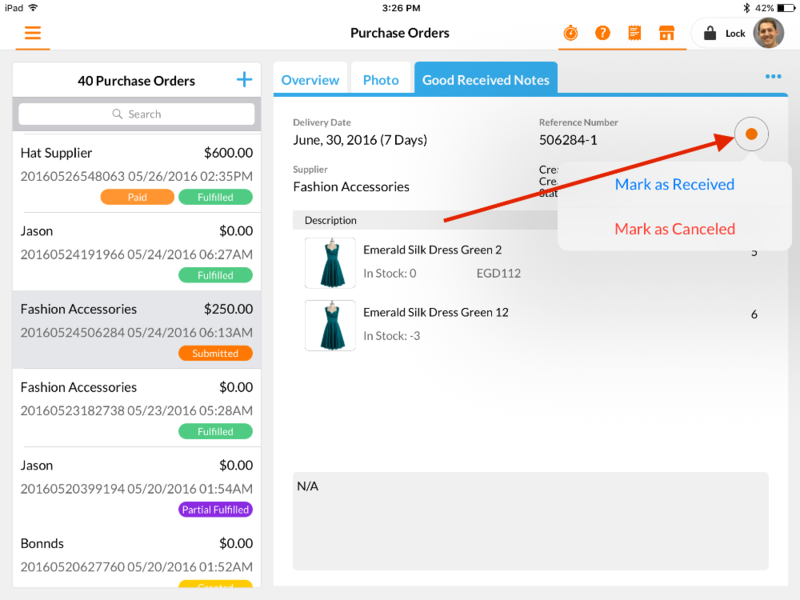 Once you've created and submitted a purchase order, you can fulfill items on the order by tapping on the “Good Received Notes” tab, then tap on the three blue dots in the top right corner and select “New Good Received Note”. This will bring up a draft "Good Received Note". With this note you can track the time of receipt, the user who entered the receipt, and the goods that were received. Tap on the "Fulfill" button at the bottom of the page to receive goods. A new window will appear where you can confirm the items and quantities of goods that you are receiving. Enter the quantity for each item in the “R.O. Qty” column or tap "Mark All As Fulfilled" to receive all goods on the purchase order. Tap Done in the top right corner. Include any comments or notes associated with the receipt of goods by tapping on the "Remarks" section at the bottom of the screen. Tap the "Save" button at the bottom left corner to save the Good Received Note. Once you’ve saved the note tap the orange dot then select “Mark as Received”. Note: "Mark as Canceled" cancels the Good Received Note only, and not the Purchase Order itself. To cancel the purchase order tap on the "Overview" tab, tap on the three blue dots in the top right corner, and tap "Mark as Canceled". 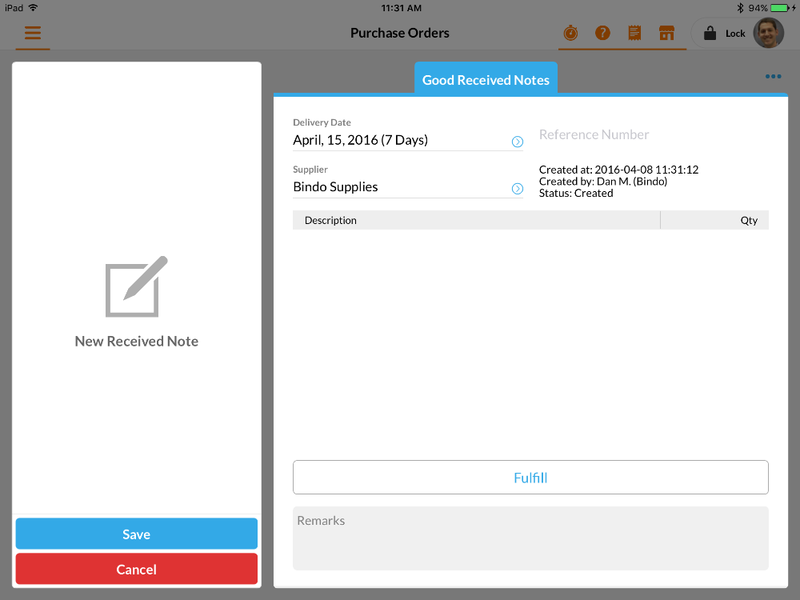 You may create multiple Good Received Notes for a single purchase order. Each note is saved and listed with a unique reference number on the Good Received Notes tab. Use Invoice delivery notes to track delivery of invoices and create a record for each delivery associated with an invoice with the option to capture a delivery confirmation signature. Additionally this feature allows you to track delivery time, the user/associate that made the delivery, and you may include individual notes for each delivery. Once an invoice is created you can confirm a delivery against that invoice by tapping on the “Delivery Notes” tab, then tap on the three blue dots in the top right corner, and select “New Delivery Note”. This will bring up a draft delivery note which includes the customer information from the invoice. 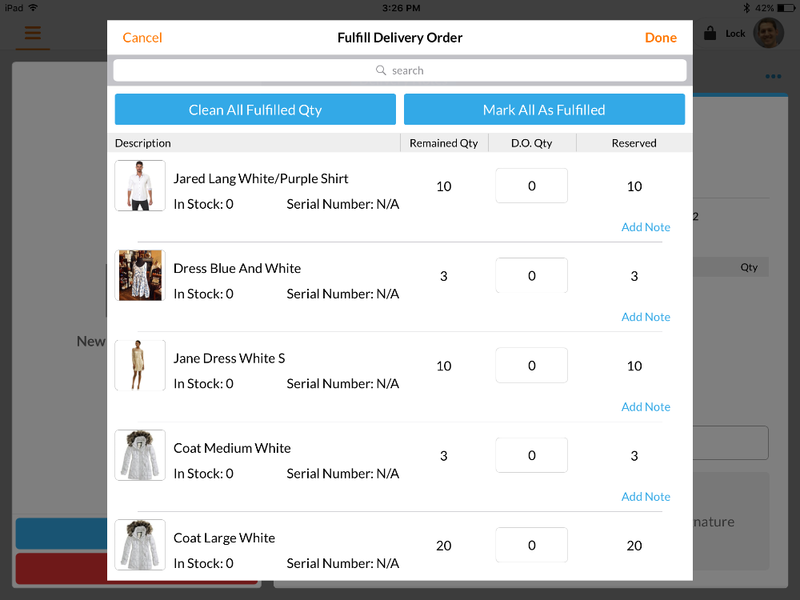 To mark items on the invoice delivered tap on the "Fulfill" button and confirm quantity of items delivered in “D.O. Qty” column. To mark all items on the invoice as delivered tap "Mark All As Fulfilled". 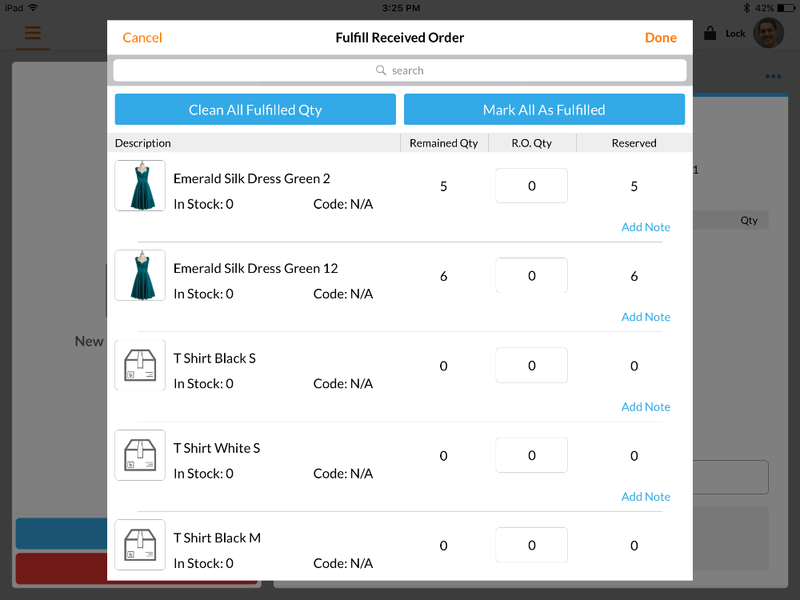 Tap the "Fulfill" button to mark items delivered - when you tap Fulfill a new screen pops up where you can confirm quantities delivered. Enter quantity of each item delivered in the "D.O. Qty" column. Tap "Mark All As Fulfilled" to mark all outstanding items on the invoice delivered. Tap "Done" to confirm. Add a delivery confirmation signature by tapping on the "Tap Here to Add Signature" box in the bottom right corner of the screen. You may also add remarks/notes by tapping on the "Remarks" section on the bottom left corner of the screen. Tap "Save" to save the delivery note. 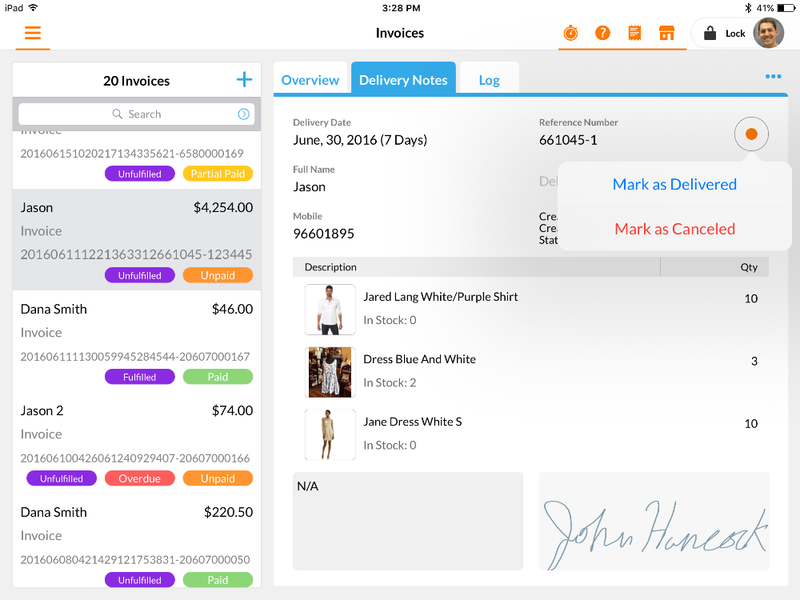 Once you’ve saved the note tap the orange dot and tap “ Marked as Delivered” to confirm all information and remove inventory from your store. Note: "Mark as Canceled" cancels the Delivery Note only, and not the Invoice itself. To cancel the invoice tap on the "Overview" tab, tap on the three blue dots in the top right corner, and tap "Cancel Invoice". 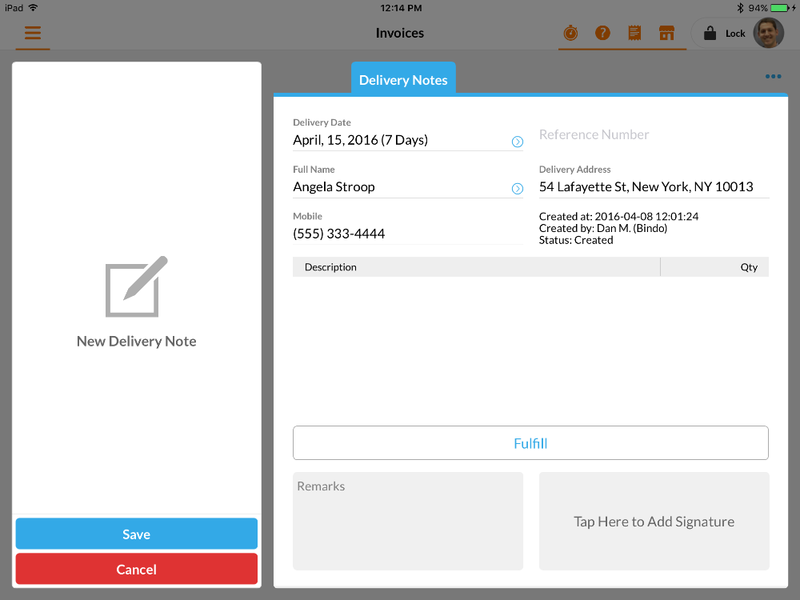 You may create multiple Delivery Notes for a single invoice. Each note is saved and listed with a unique reference number on the "Delivery Notes" tab.